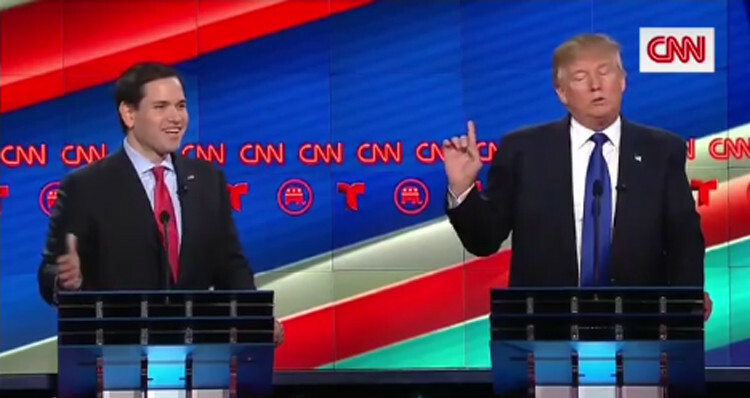 Marco Rubio thrashed Donald Trump during Thursday’s Republican debate. Republican presidential hopeful Marco Rubio went to war with Donald Trump during Thursday’s Republican presidential debate. Rubio held nothing back, attacking Trump on a variety of topics from foreign policy to his tax returns. One of the sharpest exchanges of the night occurred when Rubio asked Trump for specifics on his plans for health care. The two exchanged jabs with Trump continuing to insist that he would get rid of the current rules prohibiting the selling of insurance across state lines. Trump tried to explain himself, referring once again to state lines.